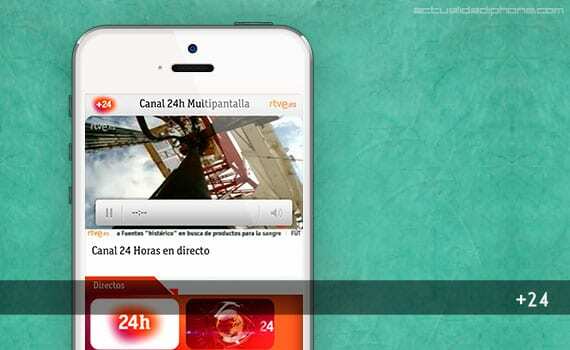 In this world there are people who prefer not to watch the news, but there are also people who can not live without knowing them currently and recently launched an application rather interesting RTVE call +24 - 24h Multipantalla Canal. The application is the easiest I've ever used, but the fact is that over complicate it would be a mistake because it is what counts. In one view we have a direct representation of the news being made at the time of using the app, while of course always available 24h Canal and taking apart other streams with specific news or other channels. In the lower part the application shows a section of the Charter, but is different from the usual Android RTVE, since this time we can see the different news have taken place in chronological order with the corresponding video, something that will allow us to learn video of what happened a few minutes or hours without any problems and all the information extracted from RTVE. I do not know about you, but I love this simple application is. Apps to fulfill their mission without detours lead us, and there's nothing like making a few taps on the iPhone screen and get exactly what we were looking for, be even better if we do not pay any money as in the case of +24, since the application is free and has no ads. However, the application has a few things to improve: the first and most obvious is that the video load when you like, and when we do not feel like dropping a mistake that leaves us without a coherent, with the feeling that something is missing from optimization work. The second is that currently seems 24h Channel which is always present, but perhaps could be incorporated as Teledeporte when other news, something that might improve in future versions of the application, and we must not forget that we are talking the first version of the app. We must rely on the good work of RTVE to improve enforcement, but as I said, it seems perfectly usable if you want to be aware of what is happening in Spain. Simple, light, is free and keeps us updated. Article +24, the app to stay informed of RTVE was originally published in News iPhone .